The gusaba is basically like a dowry giving ceremony, where the family negotiates a union between the bride and the groom. It’s a traditional ceremony and was my very favourite part of the entire day. The gusaba was scheduled to start at 9 am, but then it came to realization that yesterday was umuganda (which is basically a mandatory morning once a month where everyone in the country participates in a community service type thing), so the ceremony was moved from 9 am to 11 am. I arrived at the house where the gusaba would take place at 11 am. We knew that the gusaba wouldn’t start then because (it’s Africa) people would need to go home and get changed into their traditional clothes which could take them awhile after umuganda. When the bride arrived, it was around noon, and she came up to me and told me apologetically that I wasn’t needed til around 1 pm because that’s when they estimated the guests were going to arrive. We told her that was fine, and ran a couple of errands (like picking up the sound equipment - that was a whole other experience) and were back at the house by 1. At 1 we began to get ready in the traditional clothing. There were 4 bridesmaids and 4 groomsmen on the bride’s side, and 3 bridesmaids and 4 groomsmen on the groom’s side. As the bride’s bridesmaids, we wore red traditional dresses, and red and gold traditional head pieces. Embarrassingly enough, I started to put the headpiece on as a necklace (it was a strand of beads, seemed right to me! ), and one of the bridesmaids looked at me and laughed then said “ohya” (no) and placed it around my forehead. Oops. When we were finished getting ready it was 2:48 pm. The church wedding was supposed to start at 2 pm, and the gusaba hadn’t even started yet. I felt more stressed then I had felt at my sister’s wedding!! While we were waiting we took some photographs. And - this is no joke - I’m pretty sure I was photographed more then the bride herself. The groomsmen took turns getting their pictures taken with me! I guess a white girl is seriously exotic or something. Eventually, the ceremony started. I wasn’t needed til the very end, and my part was short, sweet, and simple. Just how I like it! Particularly because no one spoke great English so I kind of just followed the masses. The church wedding was scheduled to begin at 2 pm, though that clearly didn’t happen. 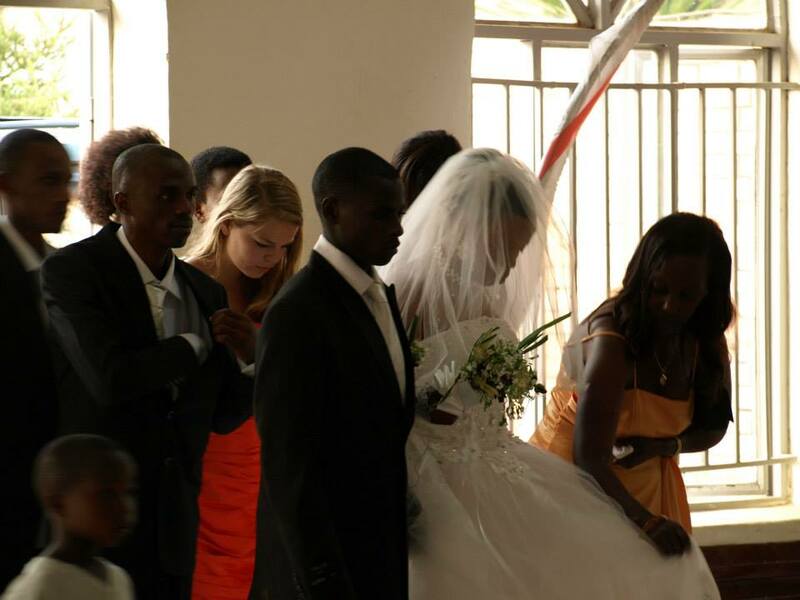 The church wedding is more of a typical western wedding. Instead of 4 bridesmaids, it gets cut down to 2 (and I made the cut - hooray!). The maid of honour is someone who is married, so this bride chose her aunt. We got ready for the church wedding at the gusaba house. The bride chose orange as her colour for the wedding. She donned a beautiful white dress with a tuele skirt and lace accents. She looked gorgeous! The other bridesmaid and I were put into strapless orange dresses. I kindly nicknamed it my traffic cone dress. It was extremely tight on the top and was extremely loose on the bottom, and it was so bright I seriously thought I’d be able to stop traffic. The church wedding started around 5 pm, and was similar to weddings here in Canada but with no “you may kiss the bride”. I was disappointed - that’s my favourite part! After the wedding, we went to the roundabout for pictures. Yes, you read that right! This specific roundabout, like the circular intersection, is the most popular place for wedding photos in Rwanda. So we all piled into a couple of vans, parked at the convenient store and walked across the intersection to the roundabout where no one smiled for pictures but me. They don’t smile for photos in Rwanda. I don’t get it. I already looked like the odd one out because of my skin colour, but throw in my big smiley face and I stuck out like a sore thumb! After about an hour of photos, it was 7:30 pm. We all piled back into the vans and drove back to the church for the reception. By this point, my shoes were killing me! I’d bought the heels from the second hand market and I could tell that my toes were starting to go this weird colour blue… Before the bridal party entered the reception, the bride and groom cut a piece of ribbon - I think to signify their marriage, but I’m not entirely sure. I have to admit, I’m not entirely sure what was happening at any moment during the entire day! The reception was fairly standard - they cut the cake, did a toast, had a couple of what I think were speeches, and had gifts given to them. But there was no dancing! That was a shame to me! The reception ended around 10:30 pm, and then they were off to the last ceremony of the day - the house warming ceremony. All the guests would go to their new house and bring their gifts as a blessing to them for their marriage. Us muzungu’s opted out of this last ceremony, since it was more designed for the family anyways. 1. It is very difficult to walk in high heels in Rwanda. 2. Bright orange seems to compliment a black woman’s skin tone so much nicer then it could ever compliment a pale white girl’s skin tone. 3. If I ever get married, I’m getting married in Canada..